The greatest American composers ever, all assembled in one handy gallery! Get to know Glass, Bernstein, Whitacre, Gershwin and all the rest. Leonard Bernstein’s big break came quite by chance when he was called to conduct the New York Philharmonic Orchestra at the last minute when Bruno Walter was struck down with flu. 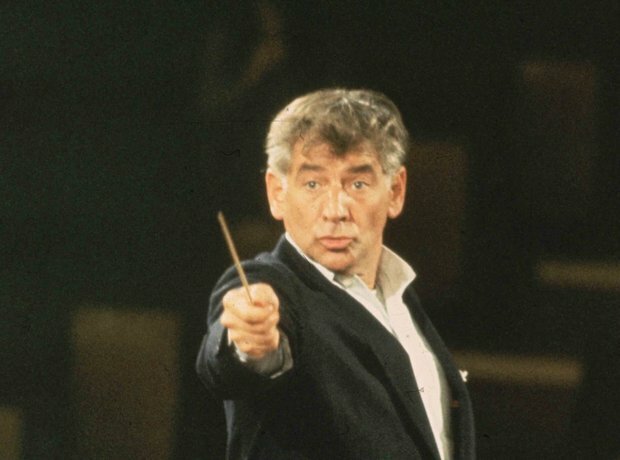 Bernstein never looked back and went on to become one of the great names in American music. A hugely talented conductor and pianist, he is best known for West Side Story that catapulted him into the mainstream. Born in Massachusetts to Ukrainian parents, he moved to New York after graduating from Harvard, where he became firm friends with Aaron Copland. Bernstein died in 1990 and as the funeral procession made its through the streets of Manhattan to his final resting place in Brooklyn, construction workers removed their hats and waved, yelling "Goodbye, Lenny". Think of a major blockbuster from the past 40 years, and it's likely John Williams provided the music: Stars Wars, E.T., Jurassic Park and Schindler's List are just a tiny list of the films that Williams has soundtracked. Born in Long Island in 1932 Williams has won five Academy Awards and four Golden Globe Awards and was was inducted into the Hollywood Bowl Hall of Fame in 2000. One of America’s most recognisable, and most successful contemporary composers, Nevada-born Eric Whitacre has become a household name across the globe. A versatile musician, he’s written for the London Symphony Orchestra and Chorus, Julian Lloyd Webber, the Philharmonia Orchestra and composed film scores; his musical, Paradise Lost: Shadows and Wings, has won a host of awards while his record, Cloudburst, was an international best-seller and even earned him a Grammy. But perhaps his most exciting project is his Virtual Choir that brings together people from around the world to sing in a truly global performance via YouTube. Maryland-born Philip Glass has had a long and varied career, collaborating with everyone from Leonard Cohen to Martin Scorsese and encompassing all musical genres. Despite gaining a wide audience outside the concert hall, Glass describes himself as a classicist writing works for the musical group which he founded, the Philip Glass Ensemble. He has picked up several awards for his soundtracks, including an Oscar for his score to The Truman show and a BAFTA for The Hours. Jiří Kylián’s ballet Wings of Wax featured the music of Philip Glass alongside that of Bach’s. Pictured is the Netherlands Dans Theatre dancing a scene from the ballet at the Edinburgh Festival Theatre in 2008. A friend of Leonard but no relation, Brooklyn-born Elmer is most famous for his numerous film scores. Amongst his great achievements were the soundtracks to The Magnificent Seven, The Ten Commandments, The Great Escape, To Kill a Mockingbird, and Ghostbusters. He won an Oscar for his score to Thoroughly Modern Millie in 1967. Along with Philip Glass, New Yorker Steve Reich is credited with spearheading the minimalist movement and helped change the landscape of classical music. His experimental works, that include ‘Come Out’, a work that features the spoken voice of one of the Harlem Six victims, led the New York Times to call him "our greatest living composer". Reich was awarded the Premium Imperial award in Music in October 2006 in Tokyo. The award highlights endeavour in areas of the arts not covered by the Nobel Prize In October 2006 in Tokyo. Samuel Barber was born in West Chester, Pennsylvania, and took a great interest in music from a young age. He wrote his first work The School for Scandal when he was just 21. A few years later he wrote the piece that he would become synonymous with, Adagio for Strings. In its original form it’s part of a string quartet but he was urged to rearrange it for a full orchestra by Arturo Toscanini. Adagio for Strings was a huge success even before it was used so movingly in Oliver Stone’s Platoon. The Metropolitan Opera's home at the Lincoln Center (pictured) was opened in 1966 with a special work commissioned for the opening by Samuel Barber entitled Anthony and Cleopatra. Another New York born composer, Ungar is perhaps known for his Ashokan Farewell. It's a piece of music written as a farewell waltz for the annual Ashokan Fiddle & Dance Camps, that Ungar ran with his wife at at the Ashokan Reservoir lakefront campus in the state of New York. The tune was later used as the title theme of the 1990 US mini-series, The Civil War. Lauridsen’s fantastic body of work, which includes O Magnum Mysterium, Contre Qui, Rose and Dirait-on has made him the most-frequently performed American choral composer. Born in Washington State in 1943, he moved south to study composition at the University of Southern California in the early 1960s. He still teaches there to this day, splitting his time between the university and Waldron Island off the coast of Washington State where he writes in a converted general store. The 2012 documentary film Shining Night: A Portrait of Composer Morten Lauridsen (DVD pictured) follows the composer from his Waldron Island retreat to rehearsals in California and Scotland. Born in Brooklyn to a Ukrainian father of Jewish descent and a Russian mother, George Gershwin straddled the classical and popular line with great success. He is best known for his orchestral compositions Rhapsody in Blue and An American in Paris, as well as his opera Porgy and Bess (pictured). Based on DuBose Heyward's novel Porgy, the opera tells the story of African-Americans living in the slums of 1920s South Carolina. In caused quite a stir when it opened in segregated New York in 1935 with an all-black, classically trained cast. Gershwin’s famous work wasn’t accepted as a legitimate opera in the USA until the 1970s, but is now considered part of the operatic repertoire and is regularly performed internationally. Danny Elfman and Tim Burton’s collaborations have become as integral as Burton’s relationship with Johnny Depp, but the Los Angeles-born composer owes arguably his greatest hit to certain yellow cartoon characters. In addition to composing The Simpsons main title theme, Elfman has composed the soundtracks to all bar two of Burton’s films. He even provided the singing voice for Jack Skellington in Tim Burton's The Nightmare Before Christmas. When he’s not busy stamping his musical mark on popular cultural, Elfman is the lead singer in rock band, Oingo Boingo. A musical maverick, John Cage was born in Los Angeles in 1912 and became a pioneer of new ways of playing and approaching music. He became one of the leading figures of the post-war avant-garde and is best known for his 1952 composition 4’33”, a piece performed in the absence of deliberate sound where audiences are asked not to listen to musicians but to the sounds around them. He also wrote several concert pieces and dance-related works, including Sonatas and Interludes on a piano that had objects placed between the hammers and strings. Aaron Copland was born in Brooklyn in 1900 to Lithuanian parents. Copland’s passion for European music lead him to the continent in his 20s, but he returned to the States inspired to become a full-time composer. Despite struggling through the Depression years, Copland finally found success with his soundtracks to Of Mice and Men and Our Town. Along with his good friend Leonard Bernstein (who he's pictured with) he tapped into a sense of North American identity through his ballet scores that include Billy The Kid and Rodeo, which established him as a serious voice in American music. Charles Ives was arguably the first American composer to become internationally well-known, conquering the world with his own unique blend of popular music, church music traditions and European influences. The Connecticut native wrote what is considered by many to be the first radical musical work of the 20th century, Central Park in the Dark, a piece that combined the popular music of the day with classical strings. But his masterpiece is the Fourth Symphony, a hugely ambitious piece that the composer described as, “Better than any other thing I've done”. The first documented performance of the piece took place at an all-Ives concert at the McMillin Theatre at Columbia University (pictured) in 1946. Not to be confused with his more famous (and more German) father Johann Pachelbel, Charles was one of the first European composers to take up residence in the new American colonies. He also has the distinction of being the most famous musical figure in early Charleston, South Carolina (pictured). It’s unclear as to why Pachelbel uprooted his family, but Pachelbel had made it to Boston by 1733 where he assisted in the installation of the new organ of Trinity Church in Newport, Rhode Island. Few of Pachelbel’s works survive; his most famous is an aria 'God of sleep, for whom I languish' while his Magnificat for double choir is remains a popular choral work. Born in Vienna, Jewish Arnold Schoenberg was forced out of Europe by the rise of the Nazis, taking a teaching position in the United States at the Malkin Conservatory in Boston. He later settled in California where he befriended fellow composer (and tennis partner) George Gershwin and began teaching at UCLA where his students included John Cage. Very unfashionable by the time of his death in 1957, Korngold’s works have enjoyed a renaissance recently. The Austro-Hungrarian composer came to Hollywood in 1934 at the bequest of his friend Max Reinhardt who wanted him to adapt Mendelssohn’s music for A Midsummer Night's Dream to his film version. Korngold soon found success in Hollywood, composing many film scores including the one that he will always be remembered for, 1938's The Adventures of Robin Hood starring Errol Flynn. Californian minimalist composer, John Adams is best known for works including Short Ride in a Fast Machine, On the Transmigration of Souls and the choral piece he wrote to commemorate the victims of the 9/11 attacks for which he won the Pulitzer Prize. This isn't the only time Adams has set contemporary events to music. He also recounted Richard Nixon’s 1972 visit to China (pictured) in his opera Nixon in China, and more recently featured Robert Oppenheimer, the Manhattan Project, and the building of the first atomic bomb in Doctor Atomic. Born in 1953, James Horner is a composer, orchestrator, and conductor, who specialises in orchestral film music. His score to the 1997 film Titanic remains the best selling orchestral film soundtrack of all time, but his other projects include scoring more than 100 films. Braveheart, Apollo 13, Troy, The Rocketeer, and Avatar are some of the more famous films which feature his scores.